Earlier this year I was given a very interesting book to read. The book was loaned to me by Mabel Robinson who has lived in Mapperley for many years. I found the book fascinating. Sad in places, humourous, educational and above all a really good read. In her book, Pam writes about staying at a lodge in Charbury and having read of her time there and the descriptions of the area and of some villagers I started to think that this sounded a lot like Mapperley. Mabel also thought this to be the case. I researched Pam and found contact details for her so emailed (with fingers crossed). I couldn’t believe it when within the next 24 hours I received a reply back. Pam now lives in Canada and has done for most of her adult life. For more about Pam you can check her website www.firstrravelbug.com or google her at Pam Hobbs, author. I was absolutely delighted when Pam wrote the following for my website. They called it Operation Pied Piper, the evacuation of children - school aged and younger - from Britain's industrial areas to the safety of less populated regions. The first wave, numbering over a million, left London at the start of war in September 1939. 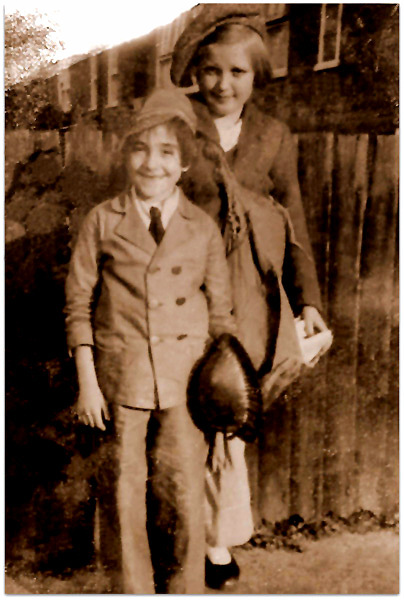 Ten months later, with invasion threats from nearby enemy-occupied France, children from England's southern coast were assembled at their schools and sent by rail to undisclosed destinations. Many ended up in Derbyshire. I was l0 at the time, my sister 12, and we were among them. The letter sent home from school was specific: every child was to bring clothes in a single bag, a gas mask, a label pinned to outer clothing giving name and home address, and a stamped postcard addressed to our parents. This would be posted upon arrival, telling them where we were. Mine informed our family that we were billeted with Aunty Ciss and Uncle Joe, in Mapperley. It was two years before I saw my parents again. My sister went home after about 14 months. I don't remember how many 'vaccys' came to the village. It wasn't compulsory to take them in, but if you had an empty bed it was expected. I can only imagine the disruption caused by one, two, sometimes three chidren, dumped on couples who had chosen not to have any of their own. I remember being content, rather than happy, in Mapperley. Like most of us, I had never been beyond my Essex home, except for the occasional day trip to London. There was a definite strangeness to our new life - farm smells, differnt dialects to understand, and the quiet took some getting used to. At home my sister and I were the youngest of seven daughters, living in a boisterous household where the wireless blared and young adults seemed to be constantly calling each other from one room to another. Now we were in an almost silent world. Heavy snow falls were a new and exciting experience. In winter I loved coming into a warm house (no shortage of coal here) to find Aunty Ciss humming or softly singing her favourite hymns, as she sat by the fire doing her knitting or darning. It all felt so very safe. FOOD. Aunty Ciss was a wonderful cook. Coming from an area where food shortages were dire, we were used to meatless stews and bread-filled sausages. Here we had an abundance of fresh garden vegetables, farm produce, homemade jams made from berries we collected, delicious bread warm from the oven. Rabbit pie laced with Bovril, bubbly fruit pies and tarts. THE COUNTRYSIDE. My love for the English countryside began in Mapperley. At home, ours was a seaside town where we spent hours on the beach and in the sea. Now I could wander for hours on my own, across fields that seemed to go on for ever. I loved checking out birds' nests for new chicks, the farm for baby pigs and kittens. Wildflowers fascinated me, the peace and silence embraced me. (Although my home town was seldom the assigned target for German bombs, if the 'planes couldn't get through to London they would drop their load on us, rather than take them home. To sleep through the night in a comfortable bed, without hearing a siren or worse, was heaven. SATURDAYS. I loved them. We had the choice of going into Ilkeston on a double-decker bus, or evacuees could join a teacher (who was a fellow evacuee) on hikes and rambles with a picnic lunch. She was the one person we could confide in, complain to, ask about news of bombing back home. But still, Ilkeston with Aunty Ciss was a real treat, especially in winter. To be among crowds at the market, busy shops, bright lights and a stop for tea in a cafe, was something we looked forward to all week. SUNDAYS. Not so much. We had to attend church three times on Sundays, and weren't allowed to play. SCHOOL. I have to say that although I liked to learn, the village school was probably the only place where I was afraid. The teacher, Mr Johnson, brandished a cane at whim, and although I never felt it, his threats had me constantly on edge. And yet this man took time to coach me privately, for a scholarship which opened doors to a life I could never have dreamed of then. For this I am ever grateful. WRITING. I developed a passion for writing, in essays and long descriptive letters home. I would sit for hours scratching out stories about everyday happenings, fellow evacuees, Aunty's cooking. Writing and travel have dictated my life ever since. After the war I wrote regularly to Aunty Ciss and Uncle Joe, and although they never replied I felt sure they were pleased to hear from me. Then, one day a letter was returned unopened, stamped simply with the word "Deceased". I was saddened beyond words because I hadn't visited them before emigrating from England. In the l980s I had the opportunity to return to Mapperley. I searched the churchyard for Cissy and Joe's graves, with no success. A teacher and several boys came by with chairs from the school. I told them of my mission, and was invited to the school but knew it wouldn't be a comfortable visit for me. Instead I went into the village shop where I met a Mrs East who recalled the evacuees, though not me in particular. We went back to her home across from the school. She made us tea, and brought out family photos which showed her two sons who I remember well. From there I walked back to the 'new' church, and sat for a bit, smiling about the time Cissy implored the vicar to let me join the choir even though I couldn't sing two notes in tune. Eventually he agreed, on condition that I mouthed the hymns, but kept my voice to myself. Operation Pied Piper was not an overwhelming success. Many unhappy children returned home within days or weeks. Many were mistreated. Many who loved the whole experience, didn't want to go home at war's end. Some, whose homes had been bombed and parents killed, were able to stay. Others returned as soon as they were old enough, to build productive lives in the countryside they had learned to love as evacuees. For my part, being evacuated gave me a compulsion to write, and itchy feet which took me far. In Toronto I found a new freedom, became a travel writer for the country's national newspaper, and was able to return to Britain often. 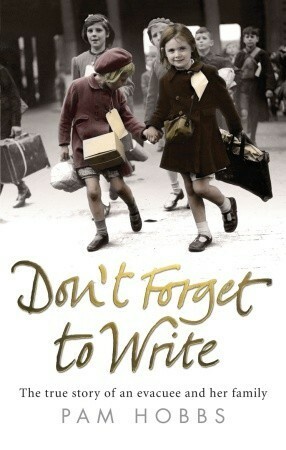 "Don't forget to Write" is my 9th book. It is published by Ebury Press, available as a paper back, large print, an e-book, and an audio version read by actress Penelope Freeman. I thank Pam so much for her wonderful words. It is really good to hear that Mr ‘Gaffer’ Johnson had such a positive influence on Pam’s life as we have only ever heard the bad side of him.